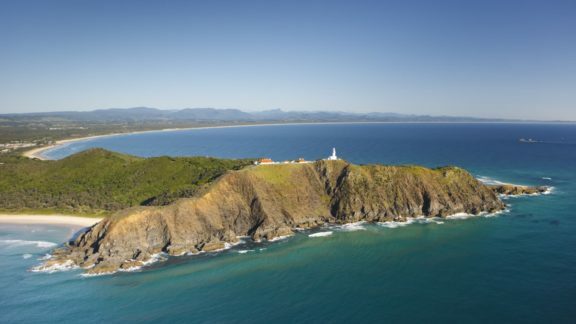 Probably the most famous thing to do is to take the time to walk to the iconic Byron Bay Lighthouse. The walk to the top takes about an hour and is filled with some of the most scenic views and beautiful beaches you can find around Byron Bay. It’s very popular to walk up here for an awesome sunrise view – don’t forget your camera. Although the first time I walked up to the lighthouse it did show how unfit I was, reaching the most easterly point of Australia is an accomplishment in itself. Nearly every time I have been up at the lighthouse I’ve seen dolphins and if you really have a keen eye you could see the odd turtle or two!! 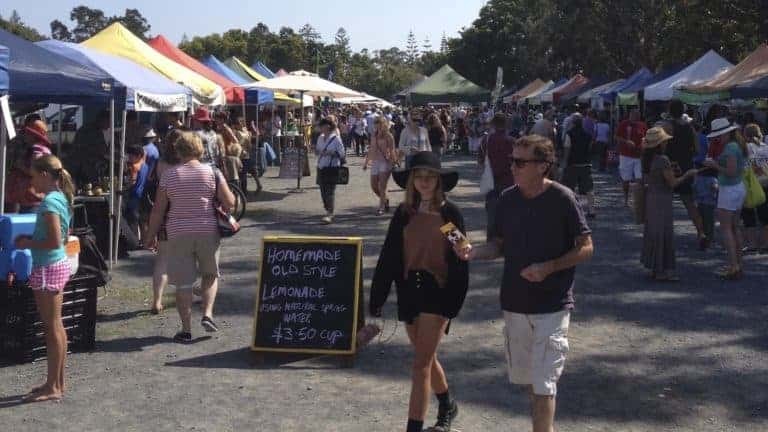 Another pretty cool free thing to do is visiting the local Byron Bay market on each first Sunday of the month. The market offers a great range of hand crafted wares, artworks, locally-grown produce and many stalls with foods and drinks. You can also make your own candle or shirt with the background music from a local band while you do it. The market is always busy with any kind of people; families, hippies, backpackers, everyone is there on Sunday morning! Another one of the nice things to do in Byron Bay. It’s part of the Gondwana Rainforests of Australia World Heritage Area. It has ancient rainforests, waterways and spectacular views over the 20 million year-old Wollumbin shield volcano and a lot of walking tracks. For instance you can do a walking track among waterfalls and pools to Minyon falls. When you’re exhausted you can take a rest at the Terania Creek picnic area. If you are in an adventurous mood you can also go there for an overnight camping trip. Byron Bay is famous for its beaches and best things about it is; they’re all free! 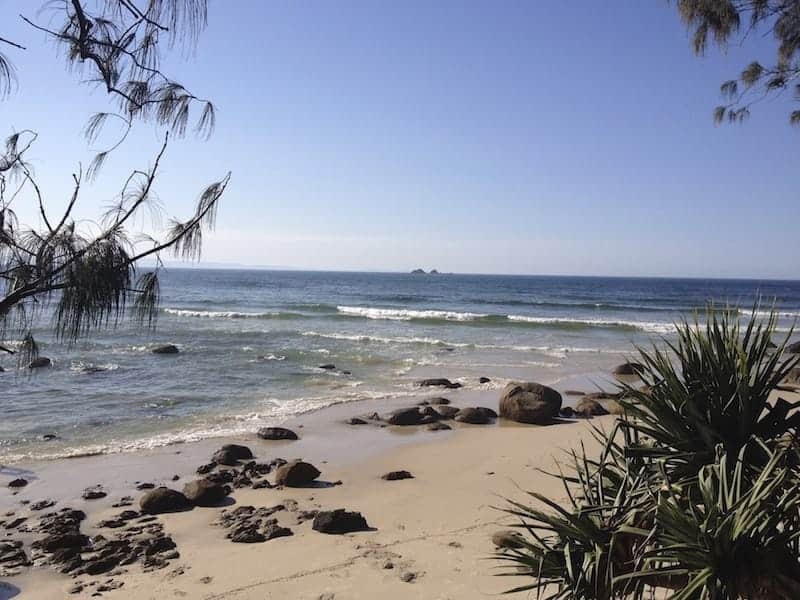 Since the weather in Byron Bay is pretty decent the entire year, why not enjoy it by laying down at the beach or by taking a dip in the ocean. Especially during the summer season the Main Beach is packed with friendly people. If you’re looking for a quieter spot then consider going to any of the other beaches: Belongil Beach, The Wreck, Clarkes Beach, The Pass, Watego’s Beach, Little Watego’s, Cosy Corner, Tallow Beach. At most of these locations one can also enjoy the Australian wildlife or watch the more adventurous people windsurfing, bodyboarding or paragliding. 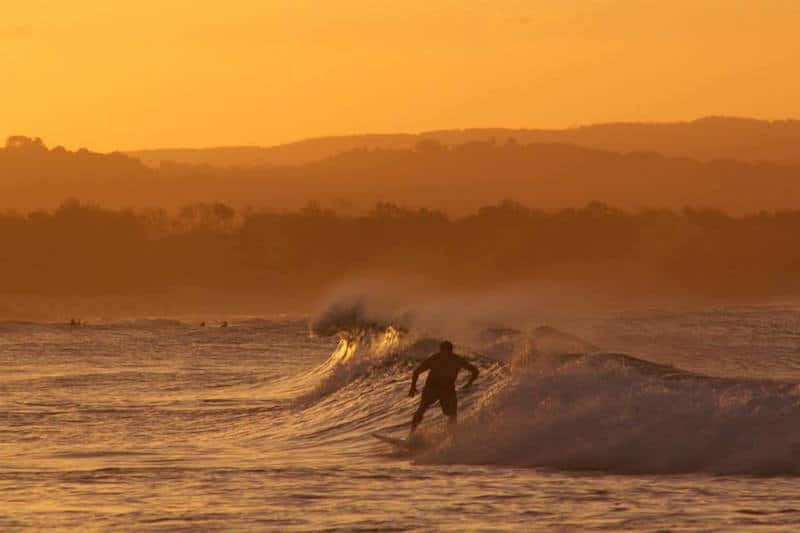 Check out our guide to the best surf beaches in Byron Bay. While walking around you notice the unique atmosphere Byron Bay has to offer. 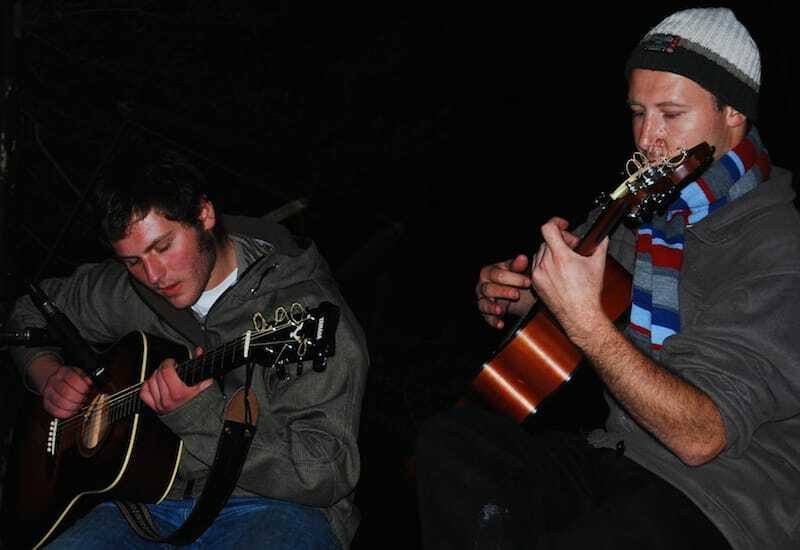 The beautiful thing about Byron Bay is that there are musicians on nearly every corner, so at night if you’re not up for hitting up pubs and clubs in Byron Bay for a wild night, take the time to stroll the streets of Byron Bay listening to the buskers. You will find the drum circle up at Main beach playing every day at sunset, and literally nearly every other corner of Byron Bay will have some sort of music to listen to. Head out to Lake Ainsworth (Tea Tree Lake) and rejuvenate yourself in it’s healing waters. You’ll need a car to get there but it’s absolutely free to swim in the lake or chill next to it. 7. Try and spot whales! 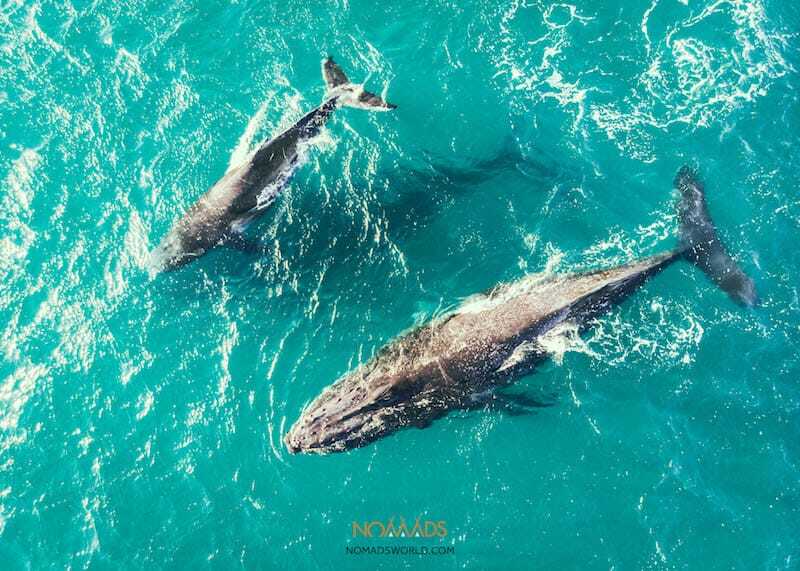 During winter you have the chance to see the migrating humpback whales from one of the many coastal walks you can do, which is an awesome experience. It’s possible to spot the whales from the lighthouse walk, or try one of the many other coastal lookouts around town. Go whale watching and dolphin spotting in Byron Bay! You’ll need a car again for this one, but visiting Broken Head Nature Reserve should absolutely be on your must do Byron Bay activities list! Check out the Three Sisters walking track walking through the rainforest to the lookout point and learning about the Aboriginal history. Or take a picnic at a beautiful spot where you’re next to the rainforest and the beach. Go for a swim then dry off whilst eating your packed lunch! As you may expect this isn’t for free but very fun to do! 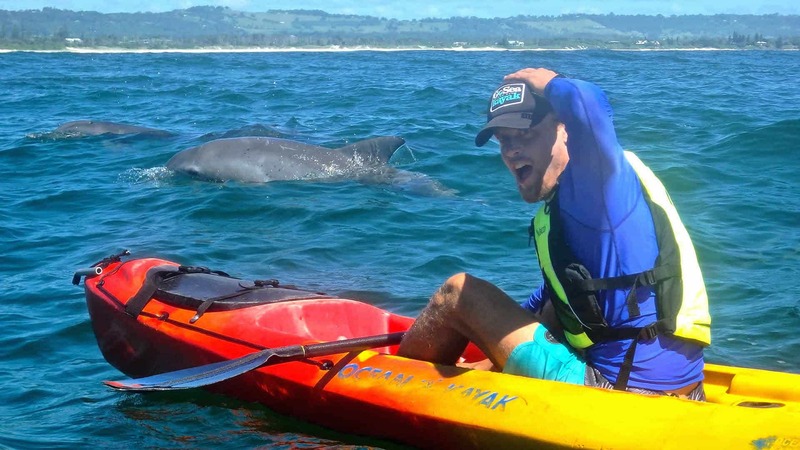 While kayaking at the Byron Bay Marine Park, you can see dolphins, turtles and from June till October you might see whales during their annual migration! It’s quite fun to do, however you will have muscle pain the day after from paddling through the waves. You can also surf the waves with your kayak, an awesome experience! During your three hour trip you’ll be guided by experts who can tell you everything about kayaking, the wildlife and Byron Bay. If you want to be even more fanatic, you can go surfing. There are a lot of surfing schools who can teach you how to beat the waves and find the best surfing beaches in Byron Bay! 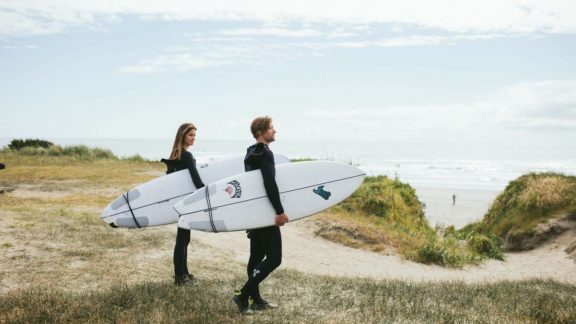 You can choose to have a few surf lessons or to go on a surf camp. The experienced instructors know the best places to surf and also watch the wildlife. Who doesn’t want to learn to surf near a few dolphins! 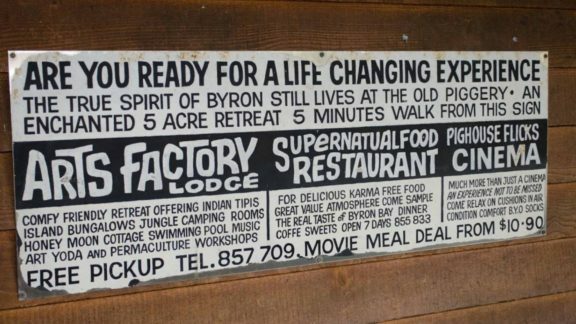 Most people see Byron Bay from land (while walking etc.) or from sea (while surfing or kayaking), but another unique way to see this most Eastern town in Australia, is by doing a skydive, paraglide or take a ride in a Hot Air balloon. 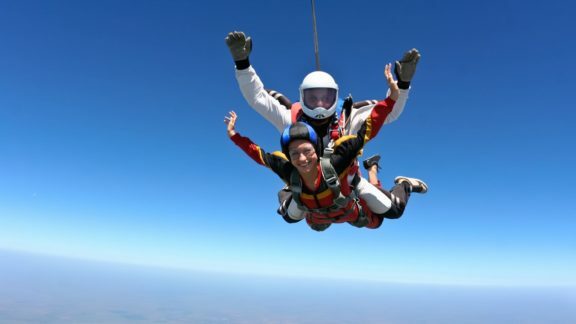 Skydiving is an absolute thrill; freefalling from an airplane at around 14,000 ft; definitely not for the faint of heart! Skydiving too much for you? Try hang-gliding! Still too much for you? Why not go on a hot air balloon ride? One hour long tour around Byron Bay and experience the beautiful scenery from a completely different point of view. For a more comprehensive list of ideas check out Things to Do in Byron Bay! Ready to experience to Byron Bay? Book your accommodation at The Arts Factory Lodge or Nomads Byron Bay.